From left to right: Revlon Colorstay liner in Blackest Black. MAC lipstick in Russian Red. Make Up Forever HD Foundation in N125. Smashbox Blush Rush in Peony. Make Up For Ever Pro Finish Foundation in N117. Laura Mercier mineral foundation primer. 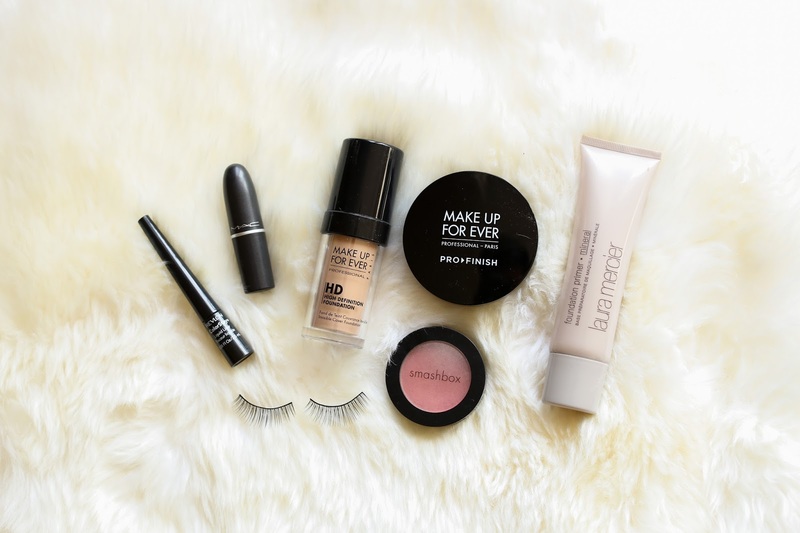 I know a lot of you have asked me what makeup products I use on my face daily, so here they are! I have a particularly yellow skin tone, to the point where almost no foundation color matches me. Make Up For Ever has a great range of shades and these particular products have medium coverage, are long-wearing but not to the point where you have to scrub it off, and suitable for all skin types! Just a note, if you decide to use the liquid + powder foundation combo like I did, get a powder that's a couple shades lighter than the liquid. I have oily skin so I need primer to help keep foundation stay on all day, and Laura Mercier's mineral foundation primer soaks up oil and mattifies the skin. Can't live without it. MAC'S lipstick in Russian Red and Smashbox's Blush Rush in Peony look amazing on all skin tones, and Revlon's Colorstay liner in Blackest Black is a great drugstore find. My lashes are Vietnamese ones that come ten pairs in a box for $7-10 at an Asian beauty supply store! I only use the MODEL 21 brand if I'm getting cheap ones because they're the most durable amongst similar brands. This particular pair is style #19--great for wearing by itself or double-stacking for more impact. I'm always open to trying new makeup products...what are your must-haves? Ein ganz toller Artikel. Immer wieder schön etwas über die Produkte zu erfahren.